Spotmau recently introduced an update of their popular PowerSuite package, an all in one Windows utility suite, namely Spotmau PowerSuite 2009. But is Spotmau PowerSuite 2009 offers us a genuine update or just a cosmetic one within its annual year reference update behind its Spotmau brand? Here we give you the sneak peak of the software. Before we continue, we want to take a look back and point that the biggest update brought by Spotmau is when they shift to Spotmau PowerSuite 2008 series early last year. Not less than 7 new modules were introduced. These modules were Windows Doctor—Windows and IE tweaking function, Windows Backup and Recovery, Security and Privacy—folder and file protection, Data Recovery—recover your deleted files, Password and Key Finder, Clone Genius, and Partition Genius. All are important functions and can be sold individually as standalone software, yet there they are bundled with the Spotmau Powersuite 2008. This year, Spotmau has brought all the features from previous version to the Spotmau PowerSuite 2009. Nothing is lost. All of their 12 modules are back in the package. Besides the 7 modules we mentioned before, the package also contains Windows Optimization, Windows Admin, Personal Safe, Data Transfer, and Spotmau Secretary. Please also don’t forget, one special function that makes Spotmau PowerSuite series is so recognizable is its capability to operate in outside Windows environment, meaning that it is bootable. With this capability, Spotmau PowerSuite can solve your Windows boot failure problems. This special function is still stays intact. So in case you have corrupted Windows installation, severe registry problem, corrupted master boot record, or other problems that cause your Windows fails to boot, just put the PowerSuite CD in your CD tray, follow the instruction, choose the right recommendation, and you are done. 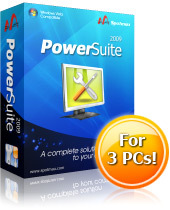 Regarding the price, this year you can buy the Spotmau PowerSuite 2009 with cheaper price for a lot more PC (one right for three PCs) and this time for only $49.95 (limited discount offer). Unfortunately, outside the modules and features brought from previous version, Spotmau PowerSuite 2009 edition is just equipped with an additional enhancement inside the module that is already there. So you will not find anything new that is big in the new package. In spite, you will find Spotmau gives a little touch here and there in the visual department but nothing noticeable. We also spot that Spotmau has strengthened the file wiper capabilities inside the Privacy Protection module. They even compare their quality with the technology used by the USA military. Another noticeable addition is that now wallpaper changer comes intact with the Spotmau Secretary module. Find out is Spotmau PowerSuite good enough for your demanding needs of Windows Maintenance needs in our full complete coverage on the product.